Innovative packaging solutions require new and sometimes delicate operations such as printing, embossing, hot stamping, holograms, varnishing, specific coating and other treatments. Each process requires advanced equipment with enhanced performances. Taking into consideration the integrity of the substrate to be unwound and/or rewound it is critical to ensure the quality of the end result. For six decades, Monomatic’s technicians and engineers have been attentive to each process requirement in order to develop specific solutions. The French company develops specific winding and unwinding technologies, covering multiple applications, and answering to numerous technical challenges while helping develop and propose solutions within the tobacco, food and liquid packaging, cosmetic, pharmaceuticals, and consumer goods packaging markets. The company’s existence is closely linked to the continuous and permanent evolution of market trends, particularly for folding cartons. In recent years, increasingly diverse, complex substrates (such as OPP, BOPP, PET, PES, PVC) and combined materials (PE coated paper or board, nonwoven complexes and laminated products) have required more sophisticated equipment in order to transport, cut and splice them. Web tension control is another very important element in the printing process since it provides the stability of the web during printing and converting operations. Based on known technologies using dancer rollers or load cells, Monomatic offers ways to manage tension control devices and is today capable of handling tension for various substrates with thicknesses ranging from 10 up to 700 microns. 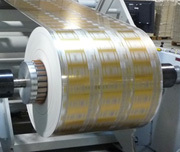 The company’s range of unwinders includes specific options in order to achieve optimized production yields while minimizing waste, in particular Monomatic’s devices are capable of splicing in register at high speed; automatically releasing the splice with a reduced remaining length on the core; motorized reel braking; automatic web tension control; and fully automated solutions. Monomatic’s range of rewinders also offers a choice of technologies adapted to the substrate to be rewound. In particular the company offers compact and economic surface drive solutions; axial drive rewinders that are suitable for sensitive materials; a combined axial and surface solution for optimized performances; « Pope design » winders for wide web applications; and optimized, controlled web tension. Beginning in 1951, the Strasbourg-based company grew to become a designer and manufacturer of non-stop unwinders and rewinders. After being integrated into the NSC group in 1999, Monomatic continues to develop internationally in partnership with the manufacturers of other product lines and by listening to the needs of end users. With exports accounting for more than 90% of the company’s sales, today Monomatic has 60 employees and its yearly turnover is approximately EUR 7 million. Its machines are installed in production lines around the world including in Europe, China, Russia, Africa, and the USA.